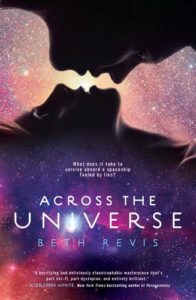 Across the Universe is a mash-up of scifi, mystery, and young-adult fiction, with a bit of romance thrown in for good measure. In a nutshell, it tells the story of a colony seed-ship on a journey towards a distant planet and the teenage girl who wakes up early – 50 years before the trip is over – only to find herself stuck in a strange, dystopian society where someone may be trying to kill her. All of this sounds fascinating, but the end result is a mystery that is telegraphed far too early and scifi that doesn’t quite stand up to scrutiny. When the main character, Amy, wakes up from cryogenic sleep – nearly dying in the process – she quickly meets the leader of the society, Eldest, and his protege, Elder, who will assume the reigns of leadership when Eldest retires. The book alternates viewpoints between Amy and Elder, which is a nice way of giving us both the insider and the outsider perspectives. The more Amy finds out about the ship society, the stranger it seems. Racial and class distinctions are gone because all of the people are genetically uniform. Rather than reproducing normally, the people on the ship go into heat during “the time”, which Amy is told is coming soon. Everyone in the working class is strangely emotionless and distant, as though they are running purely on autopilot. The only people who seem to show any spark of intelligence or normality are all considered “crazy” and given a regimen of pills to keep them under control. The mystery revolves around discovering who is unfreezing and (sometimes) killing the colonists. The author spends a lot of time early on talking about how nobody locks doors on the ship because privacy is so respected, but too much of the mystery relies on important doors remaining unlocked. This is a bit hard to swallow when Eldest spends most of the book jealously guarding his secrets, even from Elder. I didn’t have much trouble figuring out the culprit fairly early on. This is only disappointing because the book spends so much time focused on the murder mystery when it seems like the true mystery should be the nature of the ship itself. However, I will give the author credit for throwing in a few good surprises near the end of the book. One other thing that didn’t seem entirely credible was the initial configuration of the ship, with frozen Earth colonists below and living lower-class workers doing the menial upkeep of the ship for centuries while the colonists sleep. It just seemed like a recipe for class warfare, as if the ship’s initial designers set out to cause as much social friction as possible. How do you reintegrate those two groups into a working colony, with one sleeping while the other toils away? I also questioned how sustainable the ship could be with the bulk of its passengers living and reproducing and using up resources. It seems like it would be far more practical to keep everyone frozen. Although I wasn’t entirely satisfied with this book, I did check the author’s website to see if it was planned as the first in a series, and it is. The ending doesn’t exactly scream for a sequel, but it doesn’t necessarily tie everything up in a neat little bow, either. Amy finds out some hard truths after she wakes up on the ship, and those hard truths don’t just go away at the end of the book. I’d definitely be interested in reading future books set in this world, although I do hope that the author shifts her focus towards exploring some of the intricacies of the society she’s established, rather than spending so much time on a so-so murder mystery.